Crowns are full coverage restorations that go over natural teeth, either to improve their appearance, or to provide protection to a weak or heavily filled tooth. 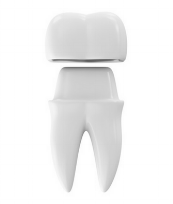 The tooth is cut down by about 1.5mm on all surfaces, to create the space for the crown, an impression is taken, the crown is fabricated in a dental laboratory, and returned to the dentist who glues it in place. A temporary crown is made over the tooth stump while the final crown is being made. The type of crown recommended will depend on the tooth involved and your circumstance. Crown types include porcelain crowns, porcelain-bonded-to-metal crowns (which combine the appearance of the tooth coloured material with the strength of metal) and gold alloy crowns. Occasionally with back teeth a gold crown will be recommended if you do not have a preference. Receiving a crown will usually require two appointments at our Geelong dental clinic. The first appointment is for the preparation of the tooth and impressions to be taken of the preparation. The second appointment is to fit the crown after it has been fabricated by the laboratory. A bridge is an appliance which is permanently fixed in the mouth to replace missing teeth. It uses remaining teeth to support the new artificial tooth or teeth. A bridge is made up of two crowns for the teeth on either side of the gap --these two anchoring teeth are called abutment teeth- and a false tooth/teeth rigidly attached in between. The false teeth are called pontics. The bridge can be made from a substructure of gold alloy or zirconia and an outer structure of porcelain all-ceramic bridges can also be made which have no metal substracture. An enamel-bonded bridge, called a Maryland bridge, uses a metal or porcelain framework to which the artificial teeth are attached, and then resin bonded to supporting teeth. A bridge is sometimes indicated as the treatment of choice to replace a missing tooth when the natural teeth on either side have extensive fillings or have undergone root canal treatment. Thus, a bridge replaces a missing tooth and restores the adjacent teeth at the same time. A bridge is placed to prevent adjacent teeth from moving out of their correct position and encroaching on the vacant space. A bridge is also a preferred alternative to a removable partial denture, all of this can take place at our dental clinic in Geelong. At Geelong Dental Centre we have invested in the latest Cerec technology available to bring you the ultimate comfort and precision dentistry.